Small group training, personal attention & soft, radiating heat similar to how the sun warms the air. First time at our yoga studio? Hot Flow Yoga welcomes you to their heated world of freedom. Through our small group practices our teachers connect with you on a personal level. With our diversity of classes, we playfully work on your mind, body and soul. 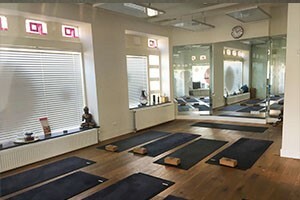 Book your class at one of our Hot Flow Yoga studios in Amsterdam. 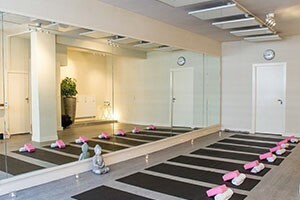 Why Hot Flow Yoga Amsterdam? Yoga practice in warmth draws its roots from thousands of years of practice in India’s tropical climate. Our practice today is drawn from ancient teachings on physical postures to improve awareness, health and spiritual connection. 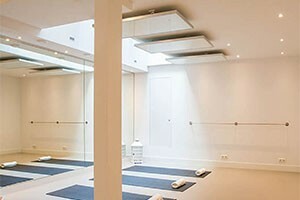 The heat you’ll experience at our yoga studios in Amsterdam will guide you into a stronger practice as the warmth offers more meaningful, deeper posture and flow options; softening muscle stretching to prevent injuries. Many yoga classes like, Vinyasa Yoga, Ashtanga Yoga and Power Yoga. What makes our classes special and different from other hot Yoga classes? Our classes are the only Yoga classes that teach Hot Vinyasa Yoga, the rest do Bikram Hot Yoga. The Bikram Yoga classes normally do a repetition of sequences; that can get a little boring. Our classes are different every time and we work the whole upper body as well as the lower body. We also do more power Yoga, involving lots of movement and arm balances. Music just made for you! A yoga class focused on slowing down both body and mind. A series of longer holds and restorative postures. Ideal for both beginners and experienced yogi’s who appreciate a slower burn. Hot Flow Yoga offers yoga practice for students of all walks of life, and at all skill levels. Our goal is to help you reach yours; whether related to fitness and strength, or calming connection and stress relief. Yoga is meant for everyone, no matter what experience you bring to the mat, whether you’re a seasoned yogi or just starting out. 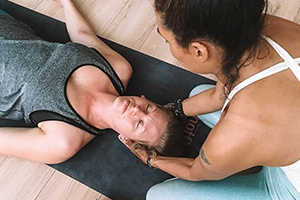 We are passionate about teaching these subjects that we naturally know, and have come to yoga from mixed sports, fitness and training backgrounds, which means we’re not only professional athletes but we’re also soul gangsters in yoga – and began our yogic journeys each many moons ago, on a path to deeper awareness, connection and physical health. Having the background that we do, we pay special attention to correct body alignment, and we work to gently correct when we see posture nearly there, so that you get the very best out of the time you put in. Hot Bro class Yoga was originally designed to bring all that male testosterone and muscle growth into balance and give you good stretches to stay free from injuries. In this Hot Bro class, we will work on hamstrings, belly fat, upper body strength, conditioning and toning your muscles and some good stretches. So, if you want to experience male oriented yoga make sure to sign up for this class by Mo Stippen! The face is filled with different pressure points and just by stimulating these through soft strokes, tension can be relieved and your mood instantly lifted. Taking time out to have a facial & skull massage fusion yoga session will help you to calm, revitalize and uplift your spirit.